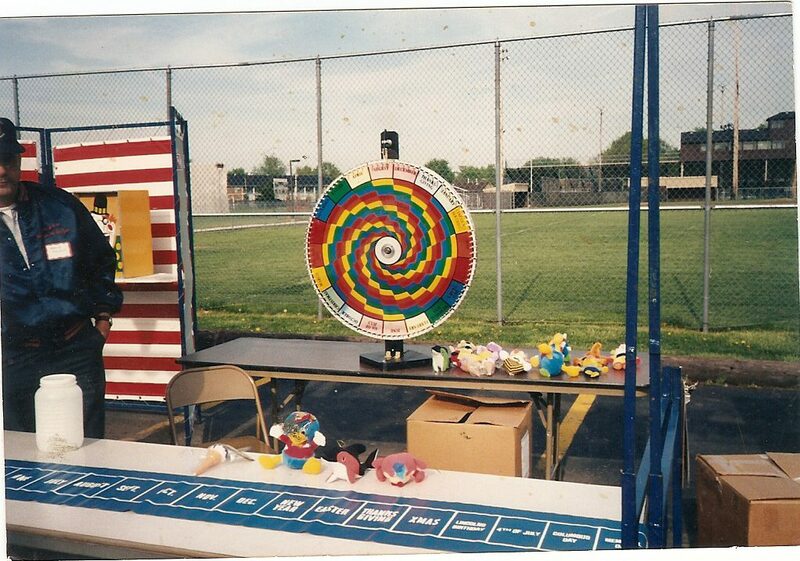 Sterling Fundways carries a large variety of carnival games for all types of events. Our games can be used for fundraising events, school and church carnivals, festivals, parties, and more and provide a wide variety of skill and luck levels that are fun and challenging for all ages. Click on each game name to see a photograph. Game and Booth rental are $25/day. All games are subject to a delivery fee. Pitch Till U Win: Toss ring over peg, whatever you ring, you win. Clown Face Bean Bag: Toss two bean bags through the clown’s mouth. Mickey Bean Bag: Toss two bean bags through Mickey’s hands. Garfield Bean Bag: Toss two bean bags through Garfield’s mouth. Roll Down: Roll balls into numbered slots. Total score of under 12 or over 30 wins. Win Lose Draw: Roll balls down trying to make three in a row. Rainbow Roll: Roll balls into colored slots, one in each color wins. Duck Pond: Choose a duck from the pond. The number on the bottom of the duck denotes the prize. Spinning Wheel: Guess a number, spin the wheel. Bumper Car: Push car on the track, wherever it stops is where the player chooses the prize. Lollipop Tree: Choose a lollipop from the tree, a colored tip wins a larger prize. Pick a Pencil: A colored tip wins a prize, no color on the tip you keep the pencil. Pan Game: Toss a ball into colored slots. Road Rally: Multi-player race game. String Game: Pull three strings of colored paddles. Match two to win. Plinko: Drop a chip from the top of a maze, the chip lands in a prize slot. Birthday Wheel: A wheel with months and holidays. Guess where it stops to win. Captain Hook: Player tosses rings, trying to make one on the hook. Fat Cat: Toss balls at “cats”. Knock down two out of two to win. Krazy Kans: Try to knock six cans off platform with two bean bags. Pitch Out: Toss bean bag into the “catchers” mitt to win. Frog Hop: Launch frog trying to land in the lily pad. Cue Ball: Shoot golf ball with pool cue and try to make it into the cup. Bucket Drop: Toss ball into angled “bucket”. If it stays in, you win. Pin Ball: Roll ball at pins placed at the end of the alley, trying to knock them down. Bottle Bash: Toss bean bags at wooden bottles, trying to knock them over. Big Mouth: Toss wiffle balls into the clown’s big mouth. First and Ten: Toss football into the receiver’s waiting arms. Shuffle Alley: Slide pucks down the alley trying to land in the holes. Ring Toss: Toss rings onto colored pegs, the color denotes the prize. Lucky Strike: Toss quarters onto targets, trying to land in the red. Sidewinder: Try to drive the ball to the end of the curving road without falling off. Shuffleboard: Slide three pucks, trying to knock up six pins. Slap Shot: Try to slide a puck through the goal to win. Star Dart: Throw suction cup dart at stars on the board. Tip A Troll: Toss bean bags at rows of trolls, trying to knock them over. Stop and Throw: Toss bean bags into a stop light, trying to get one in each color. Mini Basketball: Throw ball through the hoop, two out of two wins. Cane Toss: Toss rings over canes in table, you win what you ring. Balloon Dart: Player receives two darts to pop two balloons. Apple Dart: Player receives two darts to stick two different red apples. Teddy Bear Toss: Toss rings over bear and block. Milk Can: Toss two balls into can to win. Match Color: Drop balls into colored slots, match two to win. 7-11: Toss two balls into numbered slots trying to total 7 or 11. Ball in Keg: Toss balls into kegs, two out of two wins. Add Em Up Dart: Throw darts at a numbered board and add up score. Suction Cup Dart: Throw suction cup dart at colored and star targets. Bowler Roller: Roll ball over hump and into dip. If the ball stays in the dip, you win. Monkey Face: Toss balls into monkey’s mouth to win. Tic Tac Toe: Toss balls into slots trying to make three in a row. Knock A Block: Swing ball trying to knock off the colored blocks or dice. Ring A Bottle: Toss rings over bottles. If you ring one, you win. Color Ball: Place ticket on color square, toss ball into colored slots, a match wins. Click HERE for a prize list with prices.